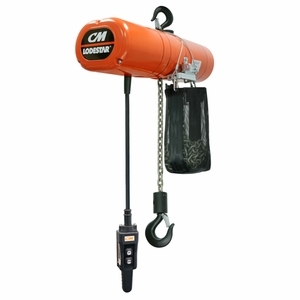 The Lodestar line of hoists is one of the most popular in the U.S.A., and this newest generation is packed with more great features than ever. For starters, how about less maintenance and easier inspection? The hoists are equipped with a DC brake designed for long service life. Lifetime grease-lubricated gear box means no oil changeout. The clutch is located outside the gear box for quick and easy inspection / repair. These hoists are also about 80% quieter than the classic Lodestar. Furthermore, all the hoists shown here come in a standard configuration with a chain container bag and rigid hook for suspension. We have 78 size and length combinations here for you to choose from, and with these hoists being made in the U.S.A. and backed by a lifetime warranty you really can't go wrong.